Recognizing the widespread use of BIM software in architectural design, OCL is pleased to offer Revit® (RFA) files for our most popular product families. 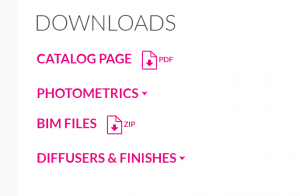 At www.OCL.com, just navigate to a product webpage and select BIM files from the Downloads menu. Then unzip the folder to access multiple files within the product family. Need a file? Ask us! We are continually adding new BIM files to complete our library. If you need a file that has not yet been uploaded, please contact us and we will produce BIM files on request!